I see several recent posts discussing the Inter Glacier and lines on Mt Ruth. You folks should head for the Fryingpan Glacier instead. Snow and crevasse conditions are excellent! 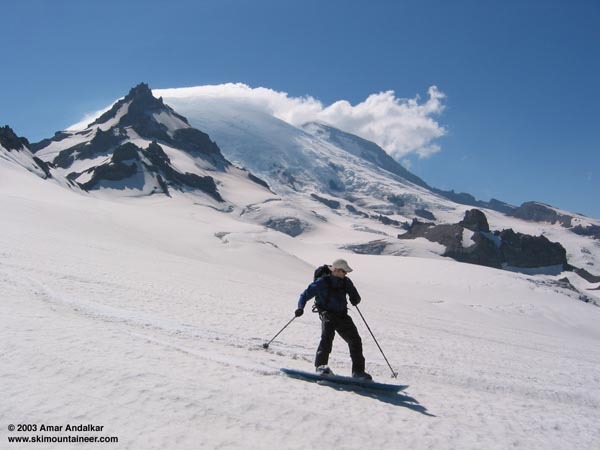 The Fryingpan Glacier has a superb position on a high plateau with stunning views of Little Tahoma and Rainier. I had been trying to find partners for a ski descent of Rainier via the Emmons during the forecast weather window on Thursday-Friday. But all the usual suspects were too busy, and so I decided to head up the Inter Glacier for a quick solo trip, mainly to get a closeup view of route conditions on the Emmons. But late Thursday evening, I found out that Matt Swallows and David Coleman were up for a day trip Friday, and so they came along. I suggested both the Inter and Fryingpan Glaciers as possible ski options. Views of spectacular lenticular clouds on Rainier during the early morning drive led us to head up to Sunrise first to take some photos. The Inter Glacier looked rather rough even from this distance, and so we eventually decided to try the Fryingpan Glacier instead. We left the Fryingpan Creek trailhead (3900 ft) at 8:45 and followed the Wonderland Trail all the way to Summerland Camp, with occasional snow patches on the final set of switchbacks. We hit continuous snow just after the camp at 6000 ft, and skinned into the bowl SE of Meany Crest, then up onto the ridge west of Point 7228 which heads for the eastern lobe of the Fryingpan Glacier. Three short carries (20-100 ft each) were needed along the moraine ridge before reaching the toe of the glacier at 7600 ft. We skinned right onto the broad ridge of the glacier and followed it directly to the 9150 ft saddle just south of the top of Whitman Crest (9323 ft) and then the highest snow just east of the crest near 9250 ft. Winds were howling at 30-40 mph above 8000 ft on the glacier, but warm temps and brilliant sunshine kept it reasonably comfortable. There are no crevasses open on this route right now, and the snow is smooth, with only the faintest beginnings of runnels and suncups. (The large bergschrund below Whitman Crest is open well north of the route we skied.) The last time I had skied the Fryingpan on July 9, 2000, there were many more open crevasses on and near the route, even though there was much more snow at lower elevations (5400-6000 ft). So conditions on the glacier this July are really outstanding. We skied down at 3:30, on somewhat grippy snow with occasional frozen bands still present. We skied well to skier's left (NW) of our ascent route, since we planned to descend via the steep slope west of Meany Crest which we had scouted from Summerland during the hike in. Several crevasses are opening on this side of the glacier, so some caution was needed to maneuver around obvious sags and holes. This side also provides some spectacular ski photos in front of the backdrop of Little Tahoma and the Emmons Glacier. We reached the top of the steep slope at 7600 ft and located the proper entrance between numerous rock outcroppings, aided by some aging ski tracks which we had observed from below in the morning. This north-facing slope was still firm at 4 pm, but had softened just enough to allow nice turns on the 40-45 degree gradient (minor suncups are beginning to roughen the surface somewhat here). We skied out the creek drainage below to the end of the snow just above 5900 ft. A quick traverse on foot across moraines and meadows brought us back to the trail at Summerland Camp. Overall, it was a fine day with pretty decent snow, total 3300 vertical ft skied, and as usual the scenery was superlative, far better than that seen from the Inter Glacier. This photo shows Matt carving a turn on the glacier near 8500 ft, with Little Tahoma and the lenticular-capped summit of Rainier in the distance. I'll try to post some route photos to the Ski Route Photos section soon.